I haven't listened to this CD in years, and though I know I got it for free, I can't exactly remember how that happened. Maybe through my job? However it happened, I was happy, because I was actually really curious to hear this album, but not curious enough to shell out the money to make that occur. I listen to Eminem and I listen to D12, and Proof's shape-shifting has always been intriguing to me. He's the only one in the D12 posse who doesn't stick with one style, and maybe it's because of that that he struck me as the one with the most to offer. I'm listening to this now and not much is coming back to me, so I don't know how much I can really say about it. 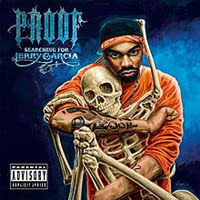 But Proof was a solid rapper, and though I guess this record didn't hit me hard enough to keep me coming back, I still have it, so there must me something to it. Right...? I remember being floored that Eminem only shows up on one song, and his name's not even listed on the back of the disc (he's just included in D12 on the song "Pimplikeness"). I figured he'd be all over this thing. Method Man and B-Real guest on "High Rollers," and if you can't guess what that song's about, you're not allowed to listen to rap music anymore. 50 Cent and Obie Trice also show up (on separate songs), and so does Nate Dogg, so you know Proof's got his guest spot game on lock.